French colonials rest amid the descruction at Verdun. Few stretches of land in Western Europe are as blood soaked as the Verdun battlefield, where 80 years ago 700,000 to 800,000 Frenchmen and Germans were killed, wounded or captured in perhaps the most terrible battle of the Great War. Extending from 21 February to 15 December 1916, it is the longest battle history has ever known. To this day, the land around Verdun is torn and scarred by the war: thousands of shell holes pock the countryside, trenches slice through woods and fields, huge mine craters gape up at the sky, and rusting clumps of barbed wire and the broken hulks of fortresses litter the area. The dead are everywhere: the ossuaire, Verdunts massive Art Deco war memorial, contains the remains of 130,000 French and German soldiers alone. This is a land where sadness hangs in the air like a living presence. The battle was designed in December 1915 by the enigmatic Erich von Falkenhayn, the German army's chief of staff. His idea was to strike a fatal blow at the roughly 20 sunken forts located in the hills near Verdun. No longer of any military value, the forts' real worth was symbolic-they represented French pride and independence, indeed the French nation itself. An attack here, Falkenhayn had reasoned with bizarre logic, would force the French to use every man they had to defend it-thereby "bleeding" the French army to death and knocking France out of the war. In the end, Falkenhayn's grim plan almost worked; unfortunately for him, he nearly bled his own army to death in the process. For the initial attack-the largest mankind had ever seen up to that time -- the Germans amassed 1200 artillery pieces, including several giant 420mm "Big Berthas." After the opening barrage, Crown Prince Wilhelm's 140,000 man-strong Fifth Army stormed up from the east bank of the River Meuse toward Fort Douaumont, the largest and most powerful of the French forts. From the outset, the French fought with a frenzied ferocity. They were not about to let the humiliation of 1870 happen to them once again. Although forts Douaumont, Vaux and others eventually fell to the German troops, every inch of ground was bitterly contested. Each German advance was met with an immediate and brutal French counter-attack. Verdun is one of military history's rare examples of the defense losing more men than the offense. The battle of Verdun was to sear the memories of all who had fought there. The battlefield was surrealistic in its horrors. Approaching the front, soldiers first noticed the sky which was an unchanging smoky grey, animated at night by fantastic writhing tongues of orange, yellow, red and icy white thrown up by the virtually unceasing artillery barrages. Some 40 million artillery shells were fired over the course of the battle, pulverizing the chalky ground, turning forests into blackened splinters and the earth into a shattered lunar landscape. This continual rain of shells hacked and rehacked bodies, ripped graves open, spewing human limbs and pieces of flesh and bone over the entire field, where they rotted in the open air. The stench was unbearable. The miserable soldiers of both sides ate, slept and fought among the dead, and the reek of death. Flying over the battlefield, American pilot Edwin Parsons, a volunteer for France and a member of the famous Escadrille Lafayette, saw below him how "...Nature had been ruthlessly murdered. Every sign of humanity had been swept away. Roads had vanished, and forests were fire-blackened stumps. Villages were gray smears where stone walls were tumbled together. Only the faintest outlines of the great forts of Douaumont and Vaux could be traced against the churned up background....only broken, half obliterated links of the trenches were visible." Nothing in the war ever equaled the intense slaughter and gothic, nightmarish qualities of Verdun. Below are some of the letters of French poilu-the average soldier-as well as a marraine de guerre (soldier's sponsor/pen pal They speak of artillery bombardments and trench life, of the indifference of civilians and the longing to see their families again. Neither officers nor politicians represent the voices of normal people. Those looking for words like "glory," "honor," and "patriotism" will not find them here; Verdun destroyed these concepts as it destroyed human lives-ruthlessly and eternally. These letters are translated as they appear in the just-published volume, 1916. Annee de Verdun. They are vivid, fragmentary, poignant and eloquent. They describe the indescribable, and the voices of the men and women who wrote them reach out across the years to modern generations, insuring that their experiences and their sufferings shall not be forgotten. "...On the 17th, at ten o'clock in the morning, the Boches started to bombard us with large caliber shells for ten hours. It was enough to drive you mad. We were buried alive my entire squad; but miraculously, all seven of us emerged without a scratch but of the five unluckily ones who came and took refuge with us in our dug-out, two were killed and three were wounded." Letter by a soldier of the 311th Infantry Regiment, June 1916. "We had no communication with the rear for three days and nights because the bombardment did not let up. We were not even able to get our rations and we only ate biscuits and chocolate and there was almost nothing to drink; finally we were able to get our rations but with a lot of difficulty; therefore, we're glad to get out of here because we've been completely brutalized by the bombardment; one has to have a strong heart to endure such a martyrdom. This is not war, it's a massacre. Oh! when will it end? It's terrible to see what's happening... "
"Anyone who has not seen these fields of carnage will never be able to imagine it. When one arrives here the shells are raining down everywhere with each step one takes but in spite of this it is necessary for everyone to go forward. One has to go out of one's way not to pass over a corpse lying at the bottom of the communication trench. Farther on, there are many wounded to tend, others who are carried back on stretchers to the rear. Some are screaming, others are pleading. One sees some who don't have legs, others without any heads, who have been left for several weeks on the ground..."
Letter from a soldier of the 65th Infantry Division, July 1916. "...I stayed ten days next to a man who was chopped in two; there was no way to move him; he had one leg on the parapet and the rest of this body in the trench. 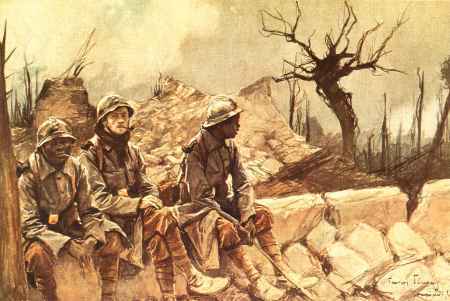 It stank and I had to chew tobacco the whole time in order to endure this torment..."
Letter from a soldier in the line near Thiaumont, June 1916. "At Verdun the ones who have suffered the most are the wounded and, along with them, the stretcher-bearers who transport them. Some of the bearers carry them from the front lines all the way to our post (1.5 kilometers); other ones take them in order to carry them off to Fleury and, having arrived there, the wounded have almost another 2 kilometers to go by stretcher before they can be transported by car. Imagine such a trip under the shells which hardly ever stop, through a landscape full of shell holes, tree trunks, and wrecked wire, through deep mud and, in certain areas, through clay where the stretcher-bearers sink down all the way to their waists, being forced to call for help to get themselves out of difficulty..."
Letter from a soldier of the 4th Infantry Regiment, November 1916. "It's an unending Hell. I live in a casement at the bottom of the fort with the light on day and night. You can't go out for fear of shell fragments which fall daily into the trenches and onto the fort. In a word, it is solitude in all its horror; when will this veritable martyrdom end?" Letter from a soldier in Fort Choisel, June 1916. "It is a war of brute material; for hours on end you bombard them with 210's, 305's, and 380's, and when everything appears dead, when there's no more wire and no more trenches and when the survivors have been reduced to a state of madness, they send the masses out to attack. When the French are on the receiving end, not one of them breaks through and if there's only 10 out of 100 left, these 10 will fight on..."
Letter from a soldier in the line, July 1916. "You must know that we are at the environs of V[erdun] ... near hill 304 and M.H. [Mort Home] ... What carnage. It is horrible to see what we are seeing; we have been here now for 12 days and every day we have serious losses. I consider myself lucky to have escaped up to now. Let's hope that it continues like this until we are relieved, which should be any day now. I hope so, because what you see everyday is enough to break your heart. Moreover, we're not well because we have all caught dysentery. You can't eat and I assure you that we're not very strong here. In short, we hope that we'll be lucky enough to make it back! ... with this heat, this stench, and all these unburied corpses and rotting flesh we think that is what's making us ill...."
"We left the trenches on the 30th with absolutely no regrets, of that you can be sure. Here life is a little more cheerful, in spite of the fact that we are not far removed from the lines, and that from time to time a few big shells come exploding around these parts. We are in underground dug-outs capable of withstanding small shells and inside of which we make fires and spend peaceful days. At night we go to work. My health is excellent...."
Letter from a soldier of the 261st Infantry Regiment, December 1916.
" Dear father, I had believed that my leave would come without delay, but I see that for the moment it is impossible for me. There is no reason to despair -- it will come later. What do you expect? When you're under orders, you can't do as you please; you're supposed to obey. You can be proud of your son. Whenever necessary, he does and knows how to do his duty." Letter from a soldier of the 173rd Infantry Regiment, June 1916. "For me, I think the civilians will manage; they envisage the war to be like an unfortunate accident, even a little inconvenient, but not too much. It seems to me that if I had relatives in the war I would not have the courage to amuse myself like certain women do, but the mind is ready and the flesh is weak..."
Letter from a marraine de guerre (soldier's sponsor/pen pal) to her filleul (war protege), October 1916. "I have returned with a famous hypocrite to see the life that one leads in Paris. One would never think that there is a war going on: cinemas, concerts, theaters are all full of people who are having fun with abandon. The husband is at the front but it doesn't matter. It's been a long time since he's been away! One forgets him and imagines that he is dead. A broken pane of glass-put another in its place; this is the motto of the women. They are the demimonde, or society people. The shops are over-flowing with fancy stuff. It is disgraceful to see such things." Letter from a soldier at the Place de Verdun, November 1916. Letter from a soldier in the 42nd Territorial Reserve, November 1916. Although by the middle of December 1916 the French had pushed the Germans back to their original starting positions of ten months before, it would be difficult to say that the French won the battle of Verdun. When the enormous numbers of dead and wounded are calculated, it is clear that the only true winner was the monstrous inferno of the battle itself, which consumed men and material like a ravenous beast. It is sobering to realize that the number of German and French killed at Verdun was, according to one estimate, around 420,000; contrast this with total British Empire dead in World War II: 353,652. Years after the battle General Petain remembered the men he had commanded at Verdun. "Their expressions," he wrote, "seemed frozen by a vision of terror; their gait and their postures betrayed a total dejection; they sagged beneath the weight of horrifying memories." They had passed through a fiery ordeal, and neither they nor the Europe they had once known were ever the same after it. The author would like to thank David Jeremiah and his wife Claudia, for help with the French translations. French quotes translated from 1916: Annee de Verdun. Service Historique de l'Armee de Terre. Panazol: Editions Lavauzelle, 1996, pp. 99, 121-22, 148, 190, 275, 288. Parsons quote from: Parsons, Edwin. I Flew with the Lafayette Escadrille. Indianapolis: E.C. Scale & Co., 1963, pp. 85-86. Petain quote from: Marshall, S.L.A., and the Editors of American Heritage. World War 1. American Heritage Publishing Co., 1964, p. 190. O'Brien Browne is the pen name of an American with degrees from The University of California at Berkeley. He lives in Heidelberg, Germany, where he studies, reads and writes. He is a member of TGWS and has promised additional manuscripts.